"If I have to give this small series of works a collective title then it would be ‘Conversing With Walls’. 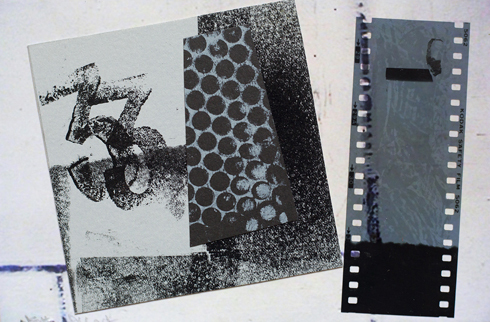 The works are postcard size digital prints with woodcut/mixed media collages on each of them. Some of the printed material is found, and I thank those who might recognise pieces discarded by them in the Glasgow Print Studio bins and on the floor. Some of the other found media used evidences how much ‘printing’ is used on every day material. The works began several years ago when I went to a pop-up exhibition in an unused building, which I then only knew as No. 8 Great Western Terrace. As I went round the exhibition I found myself becoming interested in the interior walls of the building, which was awaiting development and in a poor state. I took a number of photographs of some of the marks, forms and colour combinations that clearly had been created accidently. This year I went back to that group of photographs and did some more research. It was then I discovered that the building had been the former home of Sir William Burrell, whose collection I had visited numerous times in Pollok Park. I was also even more surprised to discover that I had also visited the building on several occasions, as a Social Worker/Mental Health Officer, when it was a residential home for adults with learning disabilities. I then decided to make a series of digital prints from some of these photographs. The collages I made on them were triggered by a combination of my responses to the marks and colours on the postcards (postcards being a form I have used before but produced by others) as well as my thoughts, memories, knowledge and ‘conversations’ of and with those who had previously lived within these walls." Image: Norman Sutton-Hibbert, 'Building the Sun', Mixed Media.